This weekend was actually quite busy for me, but in between running here and there, I made sure to make room for delicious food and fun activities. First stop was for food and coffee! My boyfriend’s favorite coffee place in the city is Linea Caffe. He goes there so often they know him by name and the staff is always super nice! The café is quite small with a few tables for outdoor seating. 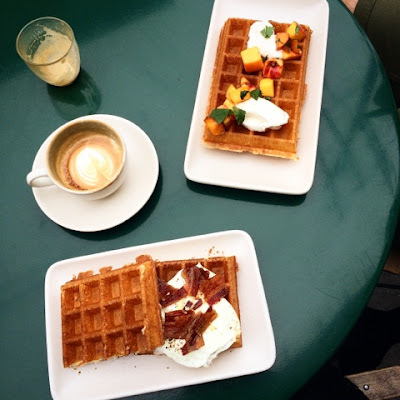 One of the cool things about Linea, besides their award-winning coffee, is that the shop teamed up with this waffle making company called Lt. Waffle. Not only can you grab your favorite caffeinated beverage, but you can also grab a gourmet brussels style waffle while you’re there! We’ve never had time to stop for brunch before so I was excited to finally get the chance. I went for the Fried Egg, Bacon & Marmalade butter waffle while my boyfriend opted for the Yogurt, Fresh peaches and Spearmint waffle. We swapped bites and they were both equally delicious. This place makes a darn good waffle! 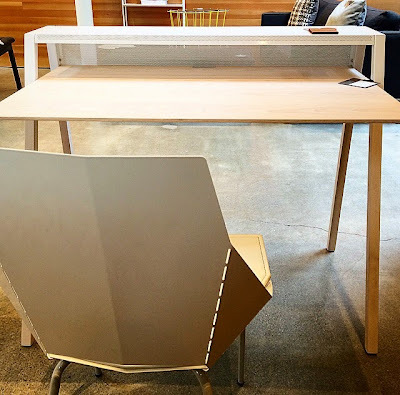 After brunch, we stopped by Blu Dot, a cute modern furniture shop, to finally order the household item that I have been wanting for months, a desk! I spend most, almost all, of my nights at my boyfriend’s apartment. He has a two bedroom apartment to himself, while I live in a house with four other roommates so it makes sense in terms of the need for privacy and more personal space. I generally don’t mind, except for certain days when I fall into a sad funk feeling like a nomad, wandering between homes. My apartment doesn’t feel like my apartment because I’m never there and his place doesn’t feel like mine because I don’t exactly have a space in it that is all my own. My boyfriend came up with the idea of getting me my own desk for the home office. I generally work at his house in the living room, on the couch, which isn’t exactly conducive to productivity. My papers end up strewn all over, the television always becomes an easy distraction and the couch is just too comfy to work for too long. Finally, I’ll have a space to call my own. (squeal!!!) I’ve already picked out a couple must have pieces from Design Darling to decorate my new desk so stay tuned for more pics! Delicious fancy breakfast toast at The Mill. Josey Baker Bread is incredibly delicious! 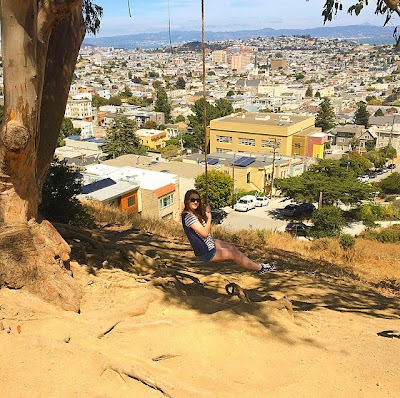 As the sun started to peak out from behind the clouds, we decided to take a little venture to Billy Goat Hill, a cute spot above Noe Valley that has amazing views of the city and a fun rope swing to pass the time! If you’re in San Francisco, make sure to go check it out! Did you all have a fun weekend? Find any cool new spots in your city? Let me know in the comments below! Reading has always been a sacred activity for me. Growing up, television was only allowed on the weekends so books became my constant companions. As I got older, my love of books became an escape from my world into someone else’s. It was a great space for my imagination to run wild as I was transported into each story. That feeling has never changed so my love of books has grown and my book collection has grown with it. Safe to say, fiction books are my favorite. I much prefer to delve into mythical worlds and the sensational adventures of fictional stories where anything is possible. In that spirit, these are some of the books that I have found myself reading over and over again! Pride & Prejudice | A classic for a reason. Every girl can resonate with the extremely independent Elizabeth Bennet as she unknowingly falls in love with the exceptionally proud Mr. Darcy. I especially love reading this book in its Penguin Classics Hardcover. The cover looks beautiful on a bookshelf. I can’t wait to collect all of the classics that have this beautiful covers. Safe Haven | I have actually never read another Nicholas Sparks book. (pause for dramatics) It’s shocked most of my female friends that I have never read The Notebook or The Last Song or many of his other popular novels. I don’t know why, but Safe Haven is the only Nicholas Sparks novel I haver ever felt drawn to read. I love imagining the seaside town in which the novel takes place. The book actually has a really powerful plot that was both terrifying and terribly romantic at different points in the story. As my first Nicholas Sparks book, I was quite impressed with Safe Haven. The White Queen | I love all the novels written by Phillipa Gregory, author of The White Queen. She has been dubbed the ‘Queen of Historical Fiction’ and she deserves that title in every way. She does her research and makes learning the background of these real historical characters as exciting and engaging as it can possibly be. The White Queen focuses on the life of Elizabeth Woodville, an english commoner who fell in love with and married the King of England. It follows her rise to power and her struggle to stay there. If you love historical fiction, pick up any book written by Phillipa, you will not be sorry! A Great & Terrible Beauty | I actually was first given this book in high school by the author Libba Bray. She came to speak to our english class about her novel, which none of us had actually read yet so none of us could ask more than general questions. After she left, I immediately pulled open the book and began to read and could not put it down. I ran into many people in the hallways of my high school whilst reading this book. The plot revolves around sixteen year old Gemma Doyle and her departure from India to an English boarding school after the suspicious death of her mother. There, she begins having these frightening clairvoyant visions and learns that her new school may know a lot more about her abilities and the history of her family than they let on. The Great Gatsby | Another classic that I have never got tired of is The Great Gatsby. The 1920’s, the large parties and the terribly tragic romances make this a book to re-read over and over again. It’s probably one of the most powerful books I have ever read. The American Heiress | Marrying not for money, but for an English title. This book follows Cora Cash as her mother marries her off to an English Duke to give her societal status that their family’s wealth could not buy. This book is a perfect read for a cold day as you dive into the newly married life of Cora Cash as she figures out the societal do’s and don’t’s of being the wife of an English Duke who is harboring his own hidden secrets. The Mortal Instruments: City of Bones | One of my favorite series to read over & over. This book is the first in The Mortal Instruments series that centers around a race known as Nephilim, part angel and part human demon hunters. The story follows Clary Fray as she finds out about a secret that her mother has been harboring since she was a baby; that she and everyone in her family is in fact a part of this hidden Nephilim race known as Shadowhunters. Such a great series for those who love fantasy fiction, I have never got tired of re-reading these books anytime I find myself in need of an epic adventure. Beautiful Creatures | For those who love witches and coming of age stories, grab a copy of Beautiful Creatures for a summer read! A great book for those looking for a supernatural romance! The main character, Lena Duchannes, is a young witch who forbiddingly falls in love with a mortal boy. She is also dealing with a tricky issue of turning of age in her magical family and having to choose to be a light witch or dark witch. The House of Mirth | I do love my classics and Edith Wartons’ The House of Mirth is among my favorites. I love the plot of this book that follows the main character Lily Bart as she tries to find a man of wealth to marry to keep herself in the lifestyle that she has become accustomed to. Her life takes a societal downturn due to several scandals and bad circumstances and the book focuses on her fight to get back her place in high society. Gossip Girl | Everyone has heard of the show, but have you read the books? The books came out years before the show ever took place and I was obsessed with them. I own the whole series and around every six months, I pick up the first book and start reading through them all over again. The author does a fantastic job at developing these characters that are living in a privileged New York society. 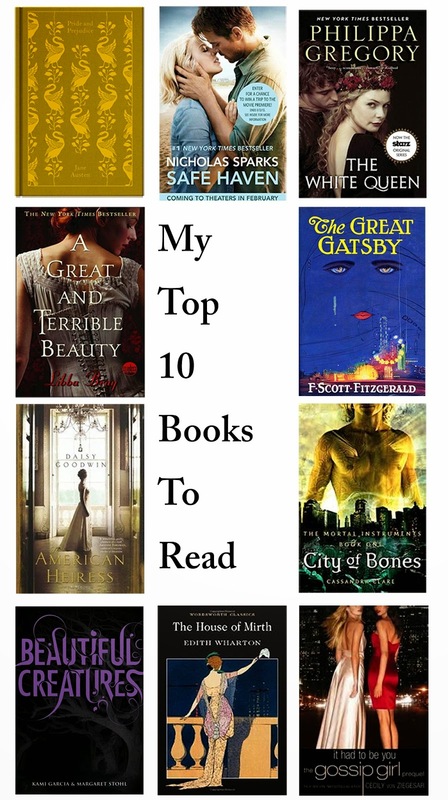 Have some favorite novels of your own that you find yourself reading over and over again? Please share them with me in the comments below! I always love finding new books to get lost in! I have loved Modcloth from afar for years. In college, I used to rabidly go through their website to bookmark all my dream and wish list dresses. I love the vintage feel to their apparel, but sadly could never afford the spendy price tag that came with the items I wanted. Finally having a big kid job that carries a paycheck, I decided to take the plunge and pick up a few items that I had been coveting. The first item being the Air of Adorable dress in Balloons. I fell in love with this dress online and it immediately went in my cart as my dress splurge. I mean come on, little hot air balloons with little faces on them? How could anyone resist? The dress came and it looked just as adorable in person. It did have some weird items in the pockets though like kleenex tissue and a wrapper for a crayola crayon? I thought that was a little odd as it didn’t say anything about the dress being worn before. Turns out, it didn’t matter anyway because the dress was a little too tight in the bust area for it to be a proper fit. I ended up returning it since there was no ability to exchange it for a slightly bigger size since it was completely out of stock! I returned it for a store credit, hoping to find another Modcloth dress to love in the future! How cute is this hidden owl coffee mug? I love the scallop details on the brim and the curly handle. It makes me so excited to get up and make coffee in the morning so I can play peek-a-boo with the little owl inside! Another thing I picked up was this little kitchen essentials storage set. I love the way it looks on the counter and it fits all my little knick knacks. This has to be my second favorite item from my Modcloth purchase, aside from my new hidden owl mug. This Prim & Proper makeup bag combines polka dots and bows, two of my favorite things, and is large enough to fit all of my clunky makeup with space to spare! As a bonus, it is very easy to wipe clean on the inside should there ever be a spill. What do you think of Modcloth? Is a favorite go to site? Do you enjoy the vintage appeal? Ever had weird things appear in the pockets of their outfits? lol…Let me know in the comments below! This past weekend, I made a plan to break up my usual food routine. I have been in a complete weekend rut for the past couple months, going to the same cafes and brunch spots over and over again. 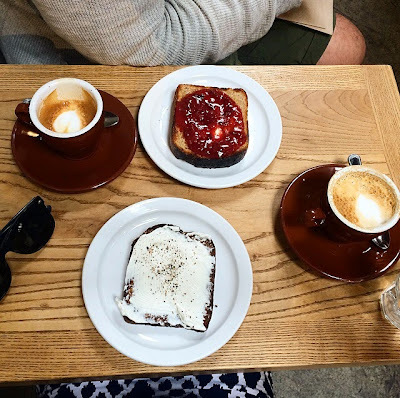 While these spots are delicious and have some of my favorite things in town, going to the same spots all the time leaves no room for spontaneity and adventure! In keeping with that theme, I decided to venture to a new brunch spot with my boyfriend on Saturday. 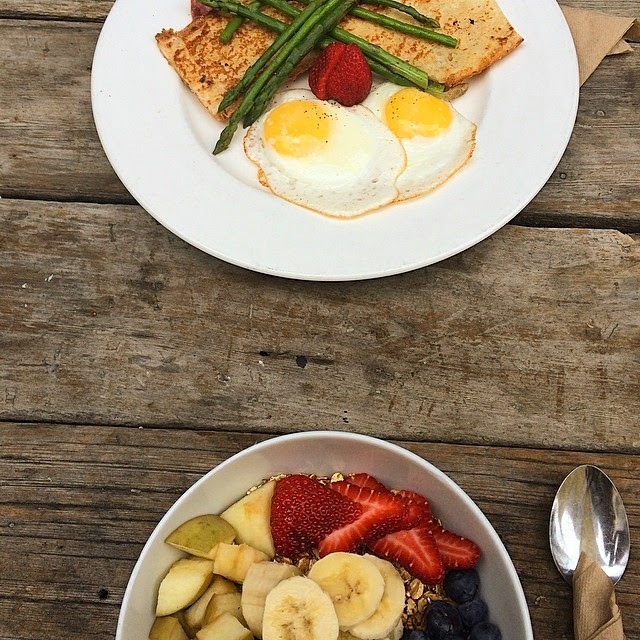 We headed to Stable Cafe, a healthy, farm-fresh food style cafe that had a ton of outdoor seating! I opted for Stable eggs, which were two sunny side up eggs, salami, asparagus and toast. I have NEVER had asparagus as a part of my breakfast, but I was surprised how much I liked it. It was a great way to get a jump start on eating my veggies for the day! My boyfriend chose the yoghurt, granola, fruit combo, which looked equally delicious as I glanced over at his bowl, so many fresh fruits! How cool does this exterior look? I was kinda obsessed and ended up taking about a dozen photos, which made me look a little like a crazy tourist. On Sunday, I had a Sephora VIB Rouge Reception that I went to with my sister. Afterwards, I explained my rut like food dilemma and we both decided that we would venture to a brunch spot that neither of us had been to before. We ro-sham-bo’d between two different establishments and landed on Café Des Amis! What I love about brunch is that you don’t have to choose between breakfast and lunch type foods. I am free to choose whatever my stomach/brain wants at the time. That is how I ended up with the random combination of French Onion Soup, a cappuccino, a Bellini and a slice of brie with some cranberry wheat bread and mixed seasoned nuts. However odd it may seem, it was utterly delicious and I left a happy camper. I needed somewhere to shoot my Outfit of the Day and the Cafe Des Amis exterior with its black paint and green shubbery was an awesome backdrop to make my stripes and whites really pop. Since the weather in San Francisco was abysmally dark and grey, we took a quick trip over the bridge to Sausalito and lo and behold, the sun appeared! We headed to a familiar spot, Bar Bocce, against my new spot rule, and absorbed the sun, fun and lots of pizza as we watched the cute little boats sway amongst the waves. Have you ever gotten into a repetitive food rut? Share any tips with me in the comments below! The end of July means the beginning of August and the roundup of my July favorites! My favorites this month are a little random, but I have been loving each and every one of them and I can’t imagine giving any of them up. My first favorite for this month was the Too Faced Natural Eyes Palette! I did a lot of traveling recently and this little baby had the perfect combo for every occasion. It comes with 9 different eyeshadow shades in a range of natural-esque colors. It even came with a little glamour guide helping you choose which eyeshadows to pair together. I decidedly went against the guide and just chose whatever colors I liked on that day. My favorite pairing is Silk Teddy, a beautiful shimmery champagne pink, Cashmere Bunny, a matte light brown and a little Sexpresso, a dark matte brown, blended in the crease. Another one of my favorites for this month was this awesome Wax/Oil Warmer from Bath & Body Works. As a candle obsessed individual, how did I not know about wax warmers? A little tea light candle placed in the warmer base slowly melts a small cube of wax and releases delicious scents. I’ve been burning little wax melts non stop during my waking hours. I especially love this little warmer because I grabbed it for 50% off at Bath & Body Works. Woot for finding sales! It looks like a large white mason jar that has a little sun rising/setting cutout in the front so that your tea light candle glows like the sun! If you’re a candle loving individual like me, you have to check out getting a wax warmer. I think this is the perfect description for Beach Walk! As you can see, it is almost gone because I have been reaching for this bottle all summer! It is a June, July, August, All Summer favorite! My SPF favorites for this Month have been from the COOLA and Supergoop brands. 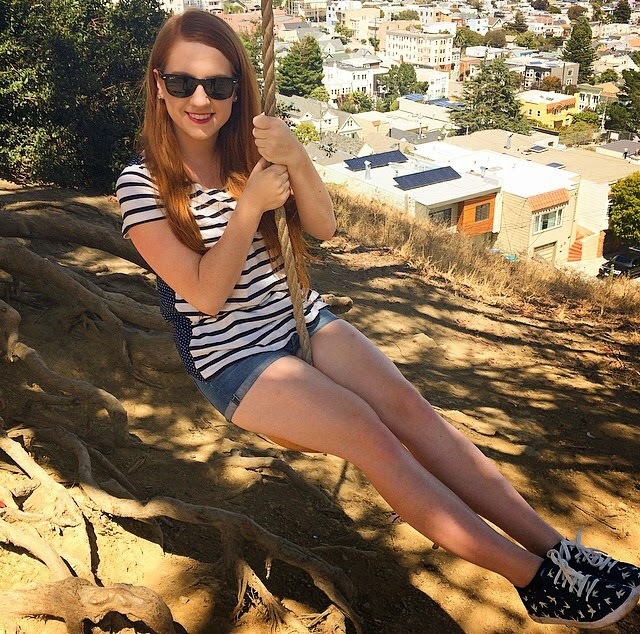 SPF is a NECCESSITY in summer, especially when you have red hair and pale skin like I do. It becomes your best friend and most loyal companion throughout the sunny months. I purchased a huge amount of different SPF products at the beginning of Summer, but this month, these are the three products I found myself reaching for the most. I have been loving the Supergoop Antioxidant-infused Sunscreen Day Cream with SPF 40. It has become my go to moisturizer for the month of July. It’s light, absorbs well and doesn’t mess with my sensitive skin, which is a big bonus for me! It also doesn’t leave behind that greasy residue that sunscreens usually do. My other two SPF favorites are for lip and body. I love the COOLA brand! They make sunscreen fun by adding delicious scents to their products! My two favorites from the COOLA line this month are the COOLA liplux in Peppermint Vanilla and the COOLA sunscreen spray in Pina Colada. I love products with fun scents and I have found myself putting my Pina Colada sunscreen spray in every bag I carry. It actually makes me excited to reapply! For my day to day lip balm, I have been loving the COOLA liplux. It has SPF 15 and a tasty peppermint & vanilla scent. It’s great for pale gals on the go because even your lips need to be protected from those rays! My last favorite for the month of July is the The White Queen Series by Phillipa Gregory. I love historical fiction, especially when it involves a monarchy! The White Queen is the story of Elizabeth Woodville, a commoner who fell in love with and married the King of England. Exciting, right?! The prequel to this book is the story that involved her mother, who claimed to be a descendent from a water goddess named Melusina. Her connection to the water goddess gave her magical abilities. It’s a great combination of fiction and reality; These women really did exist and most of these events actually happened! All of the books in this series are awesome and if you like historical fiction that has romance, drama and intrigue, I strongly encourage you to grab this book! Have a July Favorite of your own? Share them with me in the comments below! I always love discovering new things.